I created this pork sheet pan breakfast recipe because I was in need of a hearty and filling breakfast that was also egg free. I love the idea of sheet pan cooking because it is so easy, it’s a little like one pot meals but even better because you can toss it in the oven and forget about it until your timer goes off. This recipe can be easily adapted with whatever you have on hand at the time. Preheat oven to 425 degrees and line a sheet pan with parchment paper. Chop the red onion into medium dice and place on the sheet pan. Peel the sweet potato and dice small, place on the sheet pan. Chop the mushrooms in to a medium dice and add to the sheet pan. Drizzle 2 tablespoons of the avocado oil over the sheet pan along with 1/4 teaspoon of the salt and the garlic and onion powder and toss to combine. Arrange the onions, potatoes and mushrooms into a flat layer on the sheet pan. Next, chop the kale into thin ribbons and set aside in a bowl. In a bowl mix together the pork, cranberries (chop the cranberries small, if desired) 1/4 teaspoon salt and the cinnamon. Mix until all the cranberries and seasonings are distributed evenly. Form eight small patties and place them on top of the onion, sweet potato and mushrooms. While the pork is baking, drizzle the kale with 1 tablespoon of oil and massage so that the kale is thoroughly covered with oil. 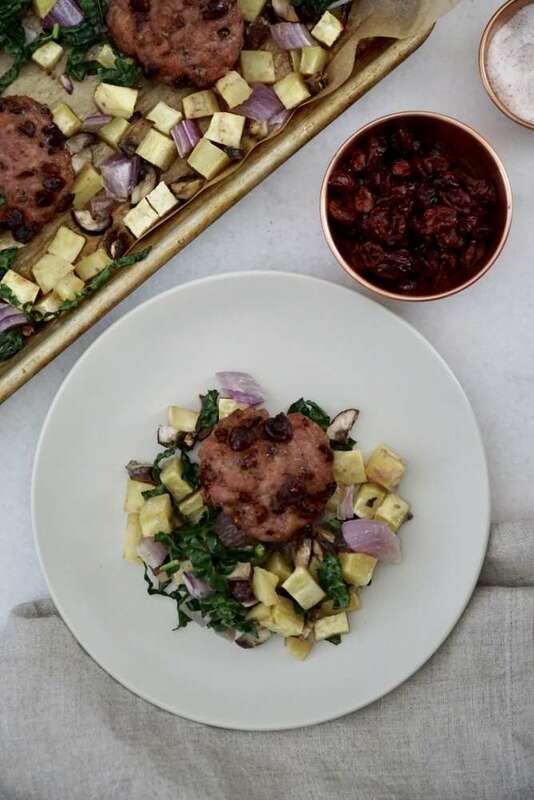 When the pork and potatoes are finished cooking, add the kale to the top of the pan and place it back in to the oven for 2-3 minutes just until the kale is wilted. If you leave it in the oven too long the kale will become crunchy. If you would like to have crispier potatoes and pork patties, place them under the broiler for 2-3 minutes before adding the kale. Keep a watchful eye, as it can burn quickly. 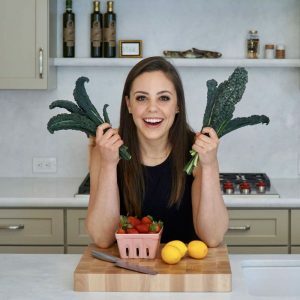 After being diagnosed with Lyme Disease, Autoimmune and CIRS, Kaylie Watson started the Autoimmune Protocol (AIP) diet as recommended by her doctor. She is always developing new AIP recipes that will encourage healing. She describes her cooking style as healing, real whole foods, and simple. She is passionate about helping others heal through food and a non-toxic lifestyle. See more of Kaylie’s recipes and lifestyle tips at Nourished Wellness.